2017 High Score Filly, Rendezvous BC. (Cicero Z x Emilion x Lord Calando). 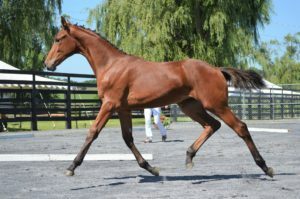 Owned and Bred by Blue Chip Bloodstock. To register a BWP foal, it must be sired by a BWP approved stallion and out of a dam that has been entered into either the main or the auxiliary studbook of BWP. With the advent of the European Union, it has recently become possible to register foals that are by outside approved stallions, and out of dams that have been entered into either the main or auxiliary studbook of BWP. These stallions must be approved for breeding by the BWP and from a BWP recognized Studbook. The stallion must be over 6 years old, and have already completed their performance requirements at the time of breeding. These requirements, DNA typing, and the payment of an additional registration fee will allow the resulting foals to be registered into one of the foal books of the BWP. The owner of the foal must submit an application to the BWP/NAD to present the foal at a Keuring. The owner must be a member in good standing with the BWP/NAD and the dam and sire must meet the above requirements. Foals must be presented to and inspected by the Keuring jury in order to be registered and branded (contact Registrar to inquire if your foal is eligible to be registered without inspection). Foals should be presented in their birth year in order to receive the Belgian brand, however, under special circumstances they may be presented as yearlings or two-year olds. Foals that score a 75 or above, out of a BWP approved mare, are given “First Premium” Status. Foals that score a 70 or above, out of a BWP approved mare, are given “Premium” Status. At three years of age (or older) fillies and prospective young stallions can be presented for inspection as breeding stock. At that time, fillies are entered into the same studbook as their dams. Four generations are required to move from the auxiliary studbook to the main studbook. Colts must meet the requirements described in the stallion section of the guidelines, and must be from the main foal book.